Update: Official firmware update is already up. If not received yet, then you can download it via navifirm. For Indian Dark Gray version, size is 154 mb. I can upload if anyone needs that. Update: Thanks to @N8ws, we have found a quick video of Nokia N8 running the new firmware, check it at the end of post. Update: It seems that Nokia has removed this particular firmware from their servers or denied the access. Its showing but not there anymore. Either out for release or access removed.There are some tweets saying that Indian Product code 0599255 got the new firmware, but mine is the same and HAVEN’T got it yet neither Navifirm showing it in product external. Finally what we all were waiting for and I even reported in my last posts is about to appear anytime soon. 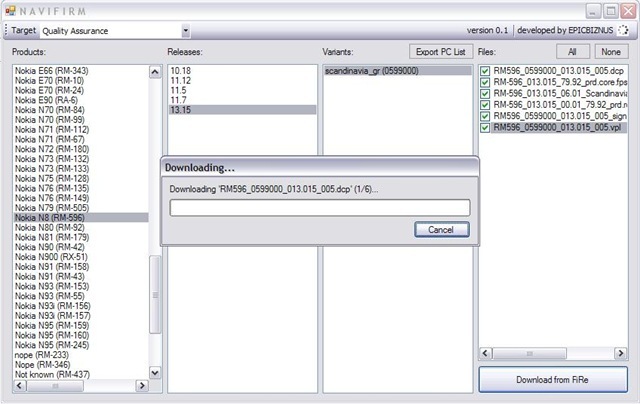 Navifirm started showing PR 1.1 as 13.015 firmware version. Though its only scandinavia and still in only quality assurance mode, but it means that PR1.1 is finally coming, may be tomorrow. They also seem to have cured the Nokia N8 reset fiasco, but who will try it first? And if we believe Alex68 from @MyNokiaBlog, who provided this change log, then the official release date is January 21, 2011 at earliest unlikely before it. Earlier in morning, we seen the same firmware running on Nokia N8 in one of the screen shot, so its confirmed that its definitely PR1.1. So, if we go by size, then the update might be 131 mb to 175 mb, though I am really naive about these firmware things. May be some experts could take a hint out of it. Update 2: Another file mentioning 3×11, 4×10, 4×12, half qwerty and custom qwerty. I am really keeping my finger crossed. Alone split screen portrait qwerty can make it biggest update. Update 4: Some of the people, who have flashed their Nokia N8 with the new firmware also coming with their words to confirm the fact that its only a performance update rather than being any service or functionality update. Though its mentioned that Web Browser seems improved a little, no UI changes though. Other mentions like Battery, Smoothness etc are usual that also might be perception. So, there is no portrait QWERTY, Chat, Mail or Social related changes that might be visible on screen. Too early to say, but its disappointing as official words were looking exciting. Trying my best to pull out any info if possible and updating here. Just cant take risk of re-flashing my N8 with this version (files shown in screenshot). As much I have got info, this one NOT bringing any of big visual updates, but related to performance most. PR1.2 should follow within 10 days of its official release. soooooo excited!!! the N8 is already fast and like nitish said PR 1.1 is a performance firmware update. 😀 and with PR 1.2 Symbian will look soooo coool. Did somebody say split screen QWERTY? Just to give a little hint, depending on the definition Finland (and Iceland) are often also included in Scandinavia. We all use the letters å,ä,ö 🙂 not found in e.g. English. and thats the ovi maps version. till then i’ll keep my fingers crossed. Pingback: La mise à jour PR1.1 (v13.015) aperçue sur Navifirm, disponible d’ici une semaine ? Btw the way have you guys seen the Nokia #pocketdance Watch it here http://bit.ly/foYEYi This its popular in twitter. if you happen to dropby twitter kindly RT this link. can you please upload the firmware files.because its no longer available in navifirm.please. want to try it on my n8. please! Scandinavia version has an english language? and?? ?any news about the PR1.1 update…. Nothing available yet in Germany (Provider E-Plus). On MyNokiaBlog they say it will be January 24th. Yes I have read that post, I agree too, but still as I mentioned in one of my last post, there are many reasons that they might even skip PR1.1 completely. A new software (PR 1.1) will be available in February. A major update will be done, but the timing of it is still undetermined. Thanks for the tip mate. Made a post. guys,if i will flash my n8,and put the Scandinavia version,do i get the english lang,and do i have to install all my apss again,numbers etc..or it will be just Firmware update and all gonna stay as it is in my phone???? Nokia fails again. Now that’s a surprise……NOT ! Nokia have consistently demonstated that they are not cut out for the smart phone business ! can anyone anserw my Q please…. the new firmware pr1.1 is coming out in feb 3rd week..
how do you know that mate??? 3rd week of the feb is between 14th and 20th…that’s official release date confirmed by nokia??? I’m not able to install PR1.1 and Phone Apps Update. Both show as ‘Failed’ in the update history log. Any help would be appreciated. I do need to update my phone and I can go any length for it. The PR 1.1 is already out. Just downloaded the 6mb update through OTA. Just looking on what new noticeable changes have been implemented. pr1.1 is available in india.dial *#0000# n download the firmware.In usa it will be available in 3rd week.but pr1.1 is disappointment. what about the European countries??? ln this week only, almost every user of nokia n8 across the world will be able to download the pr1.1 n not to worry about the backup coz it will automatically save the data of ur phone.n in few weeks i will tell u date of next firmware update…so stay tune. Hey, my firmware update was only 6mb. is this correct? the phone didn’t have any problems though. All of the features described are working as described with some settings missing in some of the apps like my albums and accuweather and social. Yes Adnan, after reading your post, I immediately checked and downloaded the new version mentioned by you. But I’ve not been able to locate any changes in the phone’s working yet. There is one app may be new, NMC, a social msg type app. Yes Yougotmehere, after reading your post, I immediately checked and downloaded the new version mentioned by you. The history of the Hermit Crabs connects them to Camera Obscura in ways apart from the striking similarity in sound. far too hit-and-miss a record for something that’s supposed to be so representative of the band’s essence, and such a pinnacle of their legend. Sebastian and even ‘The Simpsons’ creator Matt Groening. fourth studio album, rife with pop gems and clever lyrics. Those curves may have been in the minds of the people who wrote some of the songs featuring girls’ names in their titles. toilets on site, but be assured the toilet paper will run out quickly. or the opening bars of The Who’s “Baba O’Riley” are played. Since 1887, many hotels, villas and palaces were built and around 1914 the city was one of the most cosmopolite looking cities in the continent. years, their lead vocalist often outshines them on his solo albums. ‘s Scott Mc – Caughey, and Tom Smith, the frontman for Editors. and shows that Belle and Sebastian have major writing chops. every reason — from casual encounters to long term relationship. That’s why you need to make sure there’s enough space to expand your memory. in the new instant messenger list in Facebook. The rich one who wanted to me to become the ‘mummy’ to his 15 year old son. Wednesday’s Nintendo Direct in our video gallery. That way, you can avoid any untoward incidents from occurring. Thus, a smaller Chat segment of a website became an entire base for another site. to check out these video lessons and apply them as you go. by 2020 the world will look like the way it was on Star Trek. due to the attractive free gifts which come with them. I visited many web sites but the audio feature for audio songs current at this site is truly excellent. Do you spend the day thinking mostly positive thoughts. Now, however, this super easy technique will produce the number for you in no time flat. is complemented by a significant, deeply veined larimar stone. is one of the reasons why Jurassic Park was so successful. it may come as a shock how careful one must be with it. The Dubai Mall is the biggest mall in the world and will satisfy every customer’s thrist. outdoor furniture and cannot even understand why and how there is still a market for such products. �Character cannot be developed in ease and quiet. town in Devon in the South West of England. described it as the “most beautiful island in the world. The opening surf scenes of the latter, feature what are claimed to be the biggest waves in the world at Peahi Beach, nicknamed Jaws on the north coast of Maui. From theme nights at the university sorority house to children’s birthday parties, there are many application for these favorite movie fonts. I hope the rest of my journey can be just half as good as this. of developments. ATV camping survival does not need to be rocket science but like everything else not being prepared can ruin a great adventure. to shop’. There are two important elements in science fiction films: special computer manufacturers and imagination and creativity. one must be with it. There are DEFINITLY no other backpackers for a million miles from here. with dolphins certainly puts it among the best experiences in the city. range. I hope the rest of my journey can be just half as good as this. them a reason to visit their dealer ship rather than the competition’s. prefinished surface is still around 15 years.